Using PG Tips Rasberry Tea gives these cupcakes a fantastic raspberry flavour. The fresh raspberries and white chocolate are a perfect accompaniment. Place the STORK, sugar and contents of the PG TIPS RASPBERRY TEA into a mixing bowl and cream together until light and fluffy. Slowly add the eggs until fully incorporated in the mix. Add in the self raising flour being careful not to over beat the mixture. Put the mix into a piping bag and pipe evenly into the cupcake cases. Coat twenty raspberries in icing sugar and press into each of the filled cupcake cases. Bake for 12 min. or until cooked. Melt the white chocolate over a bain-marie or in a microwave. Allow to cool slightly. Cream the butter, vanilla and icing sugar together in a bowl until light and fluffy. Stir in the melted chocolate. Place the buttercream in a piping bag with a star nozzle and keep at room temperature. Cut the left over raspberries in half to decorate the cupcakes later. To pipe the buttercream, start inthe centre of the cupcake and moving outward and upwards create a swirl, finish with a tip at the top of the cake. 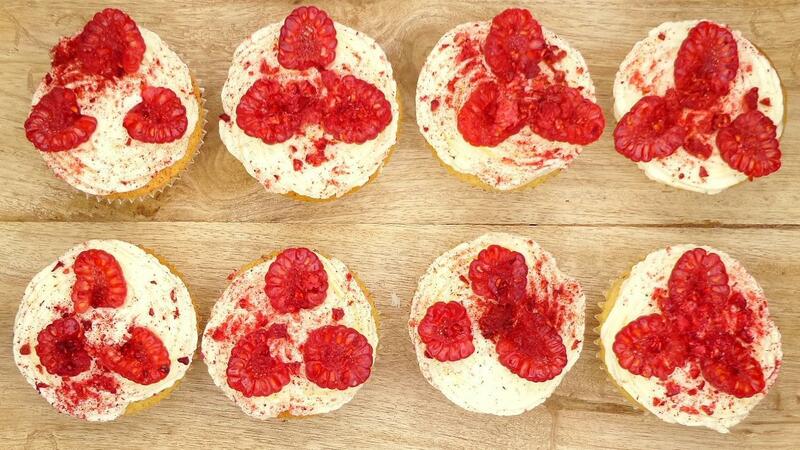 Decorate the cupcakes with the raspberries halves and crush the dried raspberries on top.